Eat it with rice, pasta or mop it up with crusty bread! QVM - Queen Victoria Market, Melbourne. The meat did look very fresh indeed and I knew I had a good deal so I bought 2 kilos. After the bargained purhased, I realised that these are BBQ Beef Spare Ribs (which can be tough) and I’ve never cooked beef spare ribs before. There’s a no open fire BBQ policy at the apartment where we stay so BBQ is out of the culinary equation. What am I going to do with these beautiful ribs that I had acquired out of greed for a discount? When I got home and rummaged through our kitchen; I found these vegetables in the fridge and some spices in the pantry. 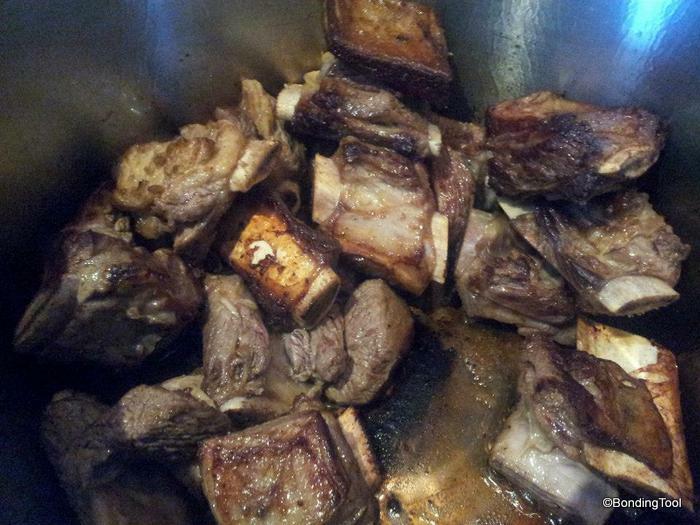 I said to myself, “yeah, a beef spare ribs stew. 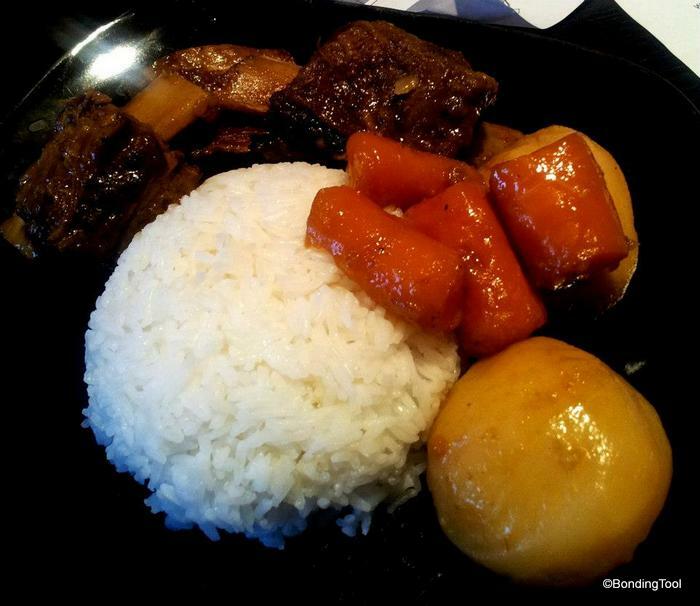 I can risk $8 developing a beef stew recipe for my in-house cookbook”. Red Onions are sweeter. Use ripen but firm tomatoes. Cinnamon, Black Peppercorns and Bay Leaves. I always scald meats whenever possible. 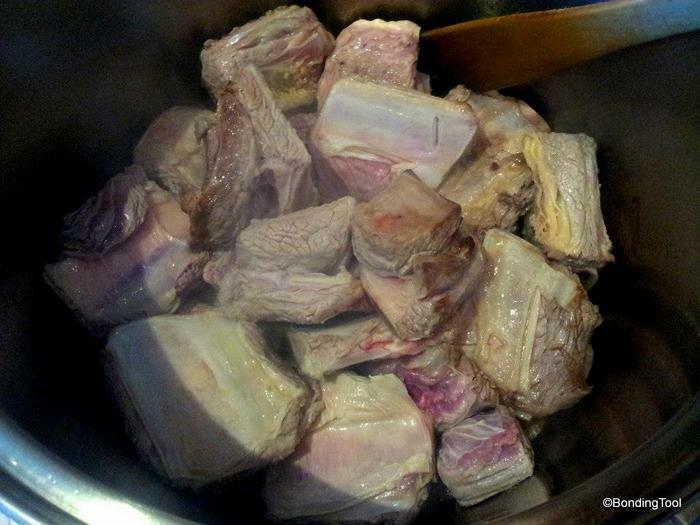 Scald the spare ribs in boiling water and immerse the meat for a few minutes till the raw meat colour change to this. Rinse well and pat dry with kitchen towels. 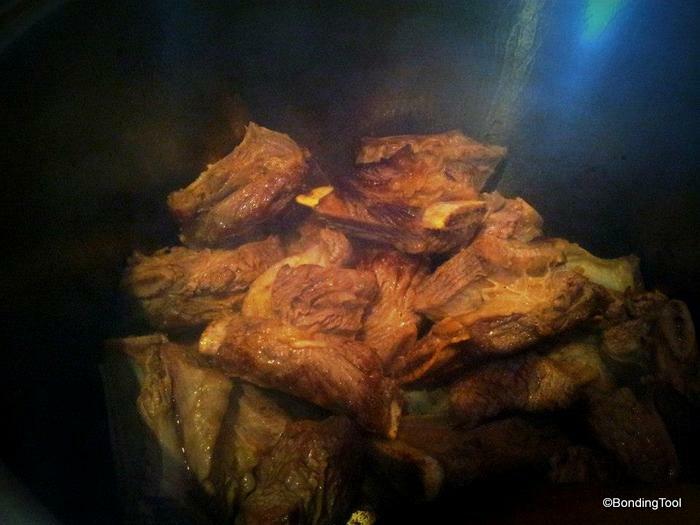 Brown meat over high heat to seal in juices. Pour some oil (I used ghee) in a stockpot, enough to create a layer on the bottom, on very high heat. Place ribs to seal in the juices. Use tongs to turn meat over. Let meat brown a little, even slightly charred. This is the right colour. Brown evenly on all sides. When meat is browned, push them aside and put in the spices and onions. Stir-fry till the onions are translucent. Add boiling water till meat is completely covered and more (about 2 litres), bring to a fast boil. Add diced tomato, tomato paste or ketchup, cayenne pepper, sweet paprika, coarse ground black pepper, dash of five spice powder and a pinch of salt. Add a handful of fried shallots. Cover the pot with lid and simmer on medium low heat till meat is half cooked (about an hour or more, depends on meat). Add carrots. When meat is ¾ cooked, add in the potatoes. 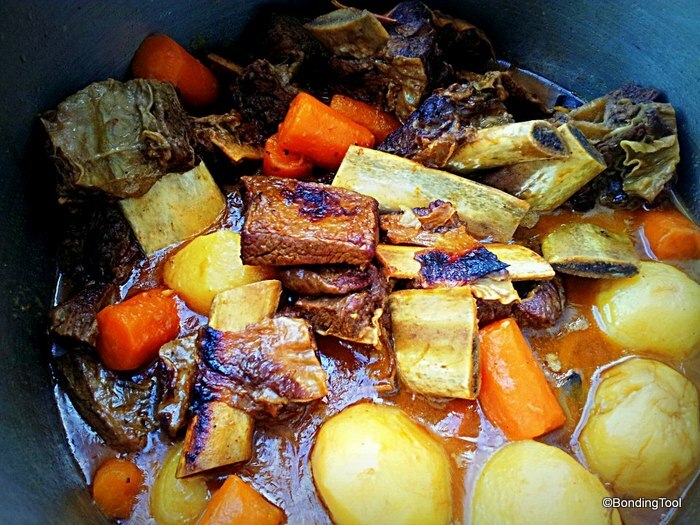 Simmer till potatoes and beef spare ribs are tender. Adjust seasoning. If not salty enough, add salt or light soy sauce (I used light soy here as it lends a certain sweetness to the dish since we did not use any sugar in this recipe). My sauce turned out well so I did not need to thicken it with cornstarch. Amount of vegetables are adjustable to your own preferences (I had these numbers coz they were what’s in my fridge at that time). 5 tablespoons Tomato Puree or Ketchup. 50g Fried Shallots (small onions). Light Soy Sauce to taste, for final adjustment after meat is tender. Enough oil (ghee) to form a layer in the pot to brown the ribs. Tip: Sticking a Chinese porcelain spoon is one trick to maintain the heat in the pot when simmering the tough meat on low flames and to shorten stewing time. The stew tastes better if you have it sit in the pot covered for 15 minutes after cooking before serving. 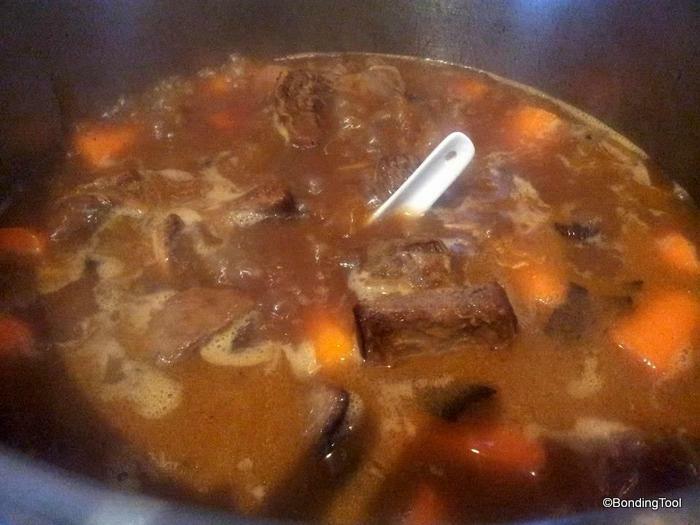 Taste great overnight – add a little water to the stew and simmer till heated through and gravy is of thick. If you want to prepare this in advance, cooked till just done, let cool completely then refrigerate/freeze. Defrost and continue cooking over stove or in oven till done.